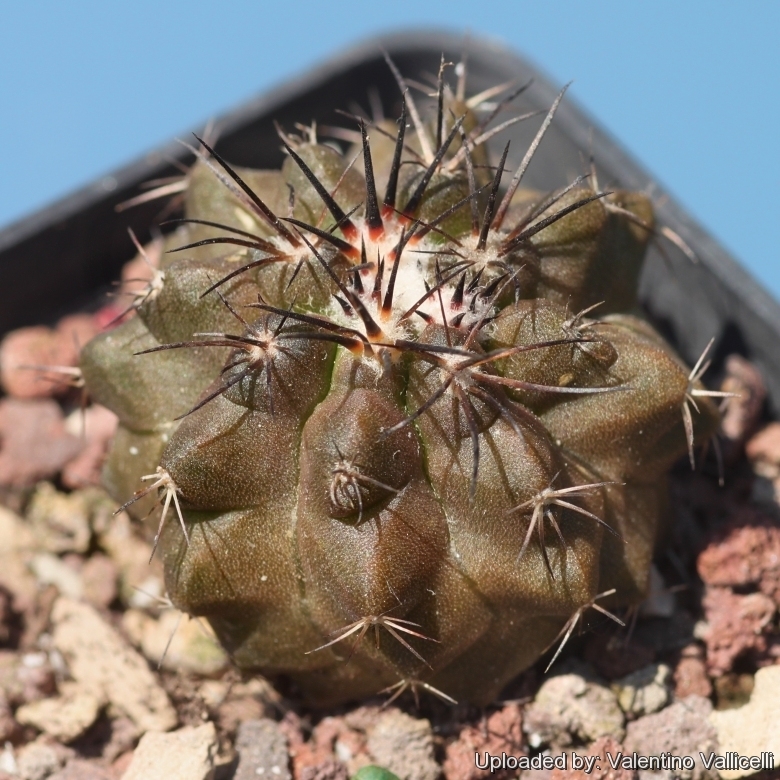 = Copiapoa bridgesii (Pfeiff.) Backeb. Cactaceae (Backeberg) 3: 1909. 1959 Backeb. Origin and Habitat: Distribution: north of Chanaral, Atacama, Chile. Altitude: 80-400 metres above sea level. Habitat: It grows in open, fully exposed and very stony coastal areas in a harsh environment together with Copiapoa lembckei and Eriosyce species. The climate is very dry, summer is hot, with extremely rare rainfall in winter. The dry season lasts 8-12 months and in some years it is possible to have no rainfall at all. Rainfall less than 100 mm per annum. The plants obtain water mainly from condensation. It's a very drought tolerant plant. Copiapoa cupreata (Poselg. ex Rümpler) Backeb. Copiapoa echinoides var. cuprea (F.Ritter) A.E.Hoffm. Description: Copiapoa bridgesii is a soft-bodied, cylindrical, very spiny cactus which is often listed as a synonym of Copiapoa echinoides, but it occurs with minor frequence and its relationship with Copiapoa echinoides is unclear. It is probably a good species (or at the most a subspecies) rather than a variety of Copiapoa echinoides. Habit: Plants solitary or forming loose clumps. Stems: At first globose, then short cylindrical to cylindrical, grass green, 20-40 cm high, 5-8 cm in diameter, very woolly at apex. Ribs: 8-12(-13), straight, rounded, slightly humped. Areoles: Small to large, ovate , with thick white-brownish felt, close set to confluent,. Spines: Black to brown, becoming gray with age. Central spines: 1-3, thick, porrect, pointing upward, 1,5-5 cm long. Radial spines: 5-10, awl shaped, stout, straight or somewhat curved, 1-2(2,5) cm long. Flowers: open funnelform, Pale yellow, 3-4 cm long. Scales of ovary and flower-tube hairless in their axils. Outer perianth-segments narrowly ovate, acute, reddish; inner perianth-segments broadly oblong, obtuse. Fruits: Round to elongate, 1,5 cm on diameter. Seeds: 1,7-2 x 1,3-1,5 mm. Copiapoa bridgesii (Pfeiff.) Backeb. : has very spiny, cylindrical stems. Its relationship with Copiapoa echinoides is unclear. It is probably a good species rather than a variety of C. echinoides. Distribution: North of Chanaral, Atacama, Chile. Copiapoa dura F.Ritter: Solitary, or forming dense clumps. The stem is firm, dark tannish-green to very dark-purple and woolly apically. The spines are very strong maroon-reddish to pure black, straight or (usually) somewhat curved upward. Copiapoa echinoides (Lem.) Britton ex Rose in Britton & Rose: small growing plant with dark purplish-brown stem and thick curved amber-maroon to black spines. This appears to be a very variable species. Copiapoa echinoides var. cuprea (F.Ritter) A.E.Hoffm. : Stems dull green to dark coppery-brown and woolly apically spines, stout bwown to black, straight to somewhat curved upward. Copiapoa griseoviolacea I.Schaub & Keim: has a dark farinose violet-grey epidermis and a dense spine covering. Distribution: south of the Huasco river. Propagation: Seeds (offsets rarely), Grafting is often used to speed growth rate of seedlings and to create a back-up to plants in collection.